As the countdown to the ICN Strategic Planning Meeting dwindled, I began to pack my bag for my 30-hour trip to Washington DC. While I was truly excited to see my ICN family and my better half (cough cough, Sami), the summer heat pricked at my cheeks and I could already tell that I was worn out from working and my flare before my trip even began. But anyone who knows me will tell you that I’m incredibly (and sometimes stupidly) stubborn, and so I set my sights on Washington and boarded the plane. Reuniting with Sami was wonderful! It did involve giving her the wrong directions to where I was standing at first – but we finally found one another in the airport and eventually made our way to the hotel. As an early birthday present, Sami had packed a ‘Twizzlers Party’ (note: my current flare leaves my diet restricted to only a few things, most notably Twizzlers and an assortment of candy). We dutifully ate the candy and caught up on life and all things gutsy - as good gutsy girls do. Thursday morning found us up early, as the alarm went off playing a Taylor Swift melody (of course). 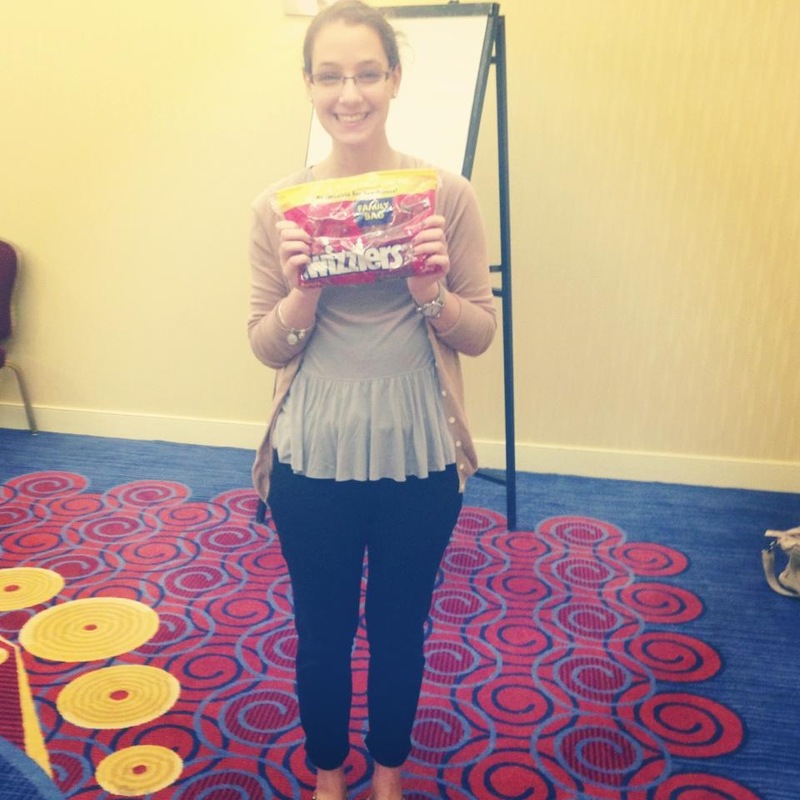 We got ready and headed down to the beginning of the meeting, where a one pound bag of Twizzlers was waiting for us for a flare-friendly lunch (you know you’re loved when!). As always, Sami and I continued to be overcome with delight and excitement at how sincerely patients are considered and integrated into the strategic planning for the network. ICN truly wants to improve care this very moment for children and their families, but they know they need everyone’s input to do it. I think it’s fair to say that we’re all pretty thrilled with the exciting things that will continue to develop in the years to come. But this post isn’t really about Washington DC or the ICN Strategic Planning meeting. It’s about being nearly 22, fresh out of college and into a ‘real person’ job, and very sick. It’s about my body not working the way I want it too and being simultaneously frustrated and determined. By the time I was ready to head back home, a mere 24ish hours after arriving, my body was throbbing with pain and the dryness of my mouth and quickened pace of my heartbeat informed me that I was quite dehydrated. The thought of the two plane rides home – getting into the airport at midnight and then having to get up early the next day for a doctor’s appointment and work – made me make my ‘this is ridiculous’ face. I just wanted to be home. Well, moreover, I just wanted to feel better. On the flight from Toronto to Halifax, I found my aisle seat, 27D, where the window passenger was sitting with her multitude of bags. “Do you think there’s someone sitting in between us?” She asked, fumbling with her purse. I shrugged and offered a diplomatic response of uncertainty, suggesting she use an overhead bin to store some of her things. The pilot came over the PA to announce that the flight was totally full, every seat was taken, and to use space as wisely as possible. So much for some elbow room, I thought. I sat and waited for the middle seat person to claim his or her seat. By this time the plane was largely full, and I was ready for every passing person to point to the seat and slither past me. And then she walked up to the row – she being Ellie Black, a Canadian Olympic gymnast who’s from Halifax. I sat up in my seat, suddenly my heart pounding not because of dehydration but because of my girl crush on this incredible athlete. She pointed to the seat and I jumped out of mine to let her in. “I’m sorry,” I said. “But you are Ellie Black?” She nodded with a big smile. Of all of the Olympic athletes, I would recognize so few, but the fact that one sat next to me made me momentarily forget about my poorly working body and focus on her. She was kind and lovely and very sweet, happily chatting with me despite her 27+ hour plane journey home from Russia (where she’d been in a competition and taken home two medals). I sat there amazed, 1) that she was talking to me and 2) how incredibly resilient the body can be. It might not seem like it, given that I have no medals or Olympic memories of my own to share, but our bodies had something in common – they are super duper resilient. Hers might be able to do flips and turns while mine struggles with functioning, but ultimately both of our bodies can be pushed to do things most people don’t think is possible. When the plane finally touched down in Halifax, it was midnight and Ellie and I both blinked awake, having falling asleep mid-flight. I pulled out my agenda book and sheepishly asked her to autograph it, which she agreed to without hesitation, addressing it personally to me. 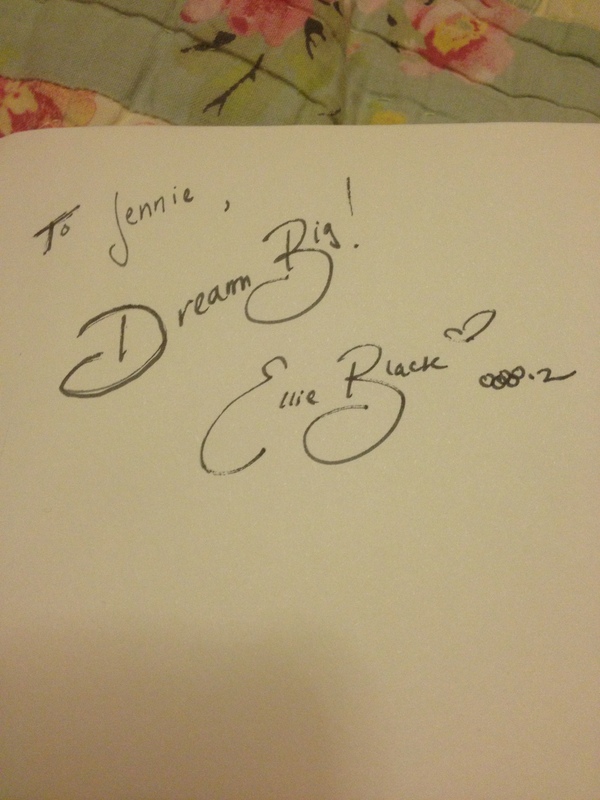 In her script writing, she scrawled, ‘Dream Big’, and handed it back to me, smiling. I thanked her profusely and safely tucked the autograph back in my bag. Maybe the airplane-gods thought I needed a little pick-me-up, or maybe it was just plain ol’ luck, but whatever it was, it reminded me that even if my body doesn’t work perfectly, I am still a champion, a fighter, and a resilient person. And now compliments of the heart-warming and inspirational words residing in the back of my planner, I can carry that message with me wherever I go.